- Fixed a bug with the callout positioning method to allow for the correct placement of wall opening text. - Intersecting walls now cut through the top plate of the primary walls at tee intersections. 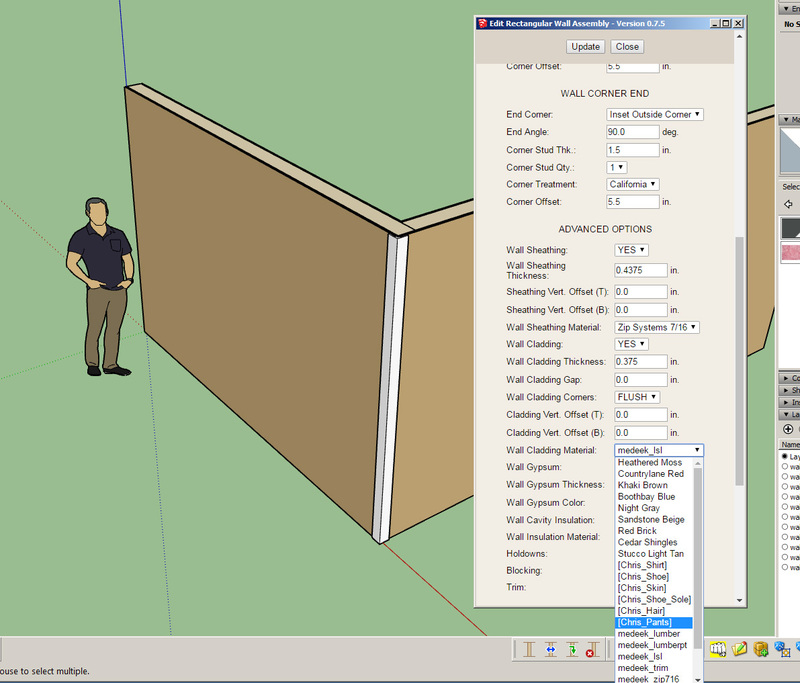 - Wall cladding and sheathing materials option now added to wall creation tool. 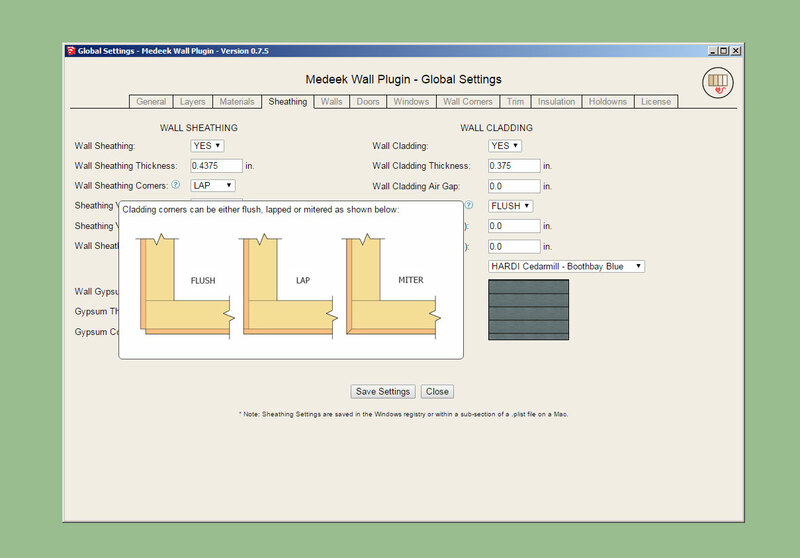 - Default behavior for the Wall Mode parameter added the Walls tab of the global settings (Line or Polyline). - Added DensGlass™ sheathing material to the sheathing tab of the global settings. - Began the addition of tooltips to every parameter within the global settings. In order to help kick off the new Medeek Wall Plugin I will be running a promotion from June 1 thru June 15. All orders of the Wall Plugin will also include a free two year license of the Truss Plugin ($50 value) and a free one year license of the Foundation Plugin ($25 value). If you have previously purchased either of these other plugins then your serial expiration date for each plugin will be extended by the time periods given above. To take advantage of this offer, once you have purchased the wall plugin, simply email me with your client ID or username and that you would like to take advantage of the June 2018 Promo. For clients that have already purchased the Wall Plugin, you can also take advantage of this offer by emailing me directly as above and I will add the Truss Plugin and Foundation Plugin to your client account or extend your serials as mentioned above. This offer is only good until June 15, 2018. All Medeek Wall Plugin orders made on June 16, 2018 (PST) or later will not be eligible for this time limited offer. Looking at garage doors this morning and I have my ideas on how one should trim these out but I am wondering if the rest of community is inline with my thinking. Feel free to email me or post on the board a garage door jamb detail/section on how you would like these put together. I'm also going to add in an advanced framing menu for the garage door option wherein the user can specify the parameters for portal framing the opening, however I may not attack this one until later since there are much bigger fires to put out at the moment. This post was prompted by some comments made on the other board regarding wall justification and cladding materials. I think this is important enough that I duplicate my response here as well. 1.) The wall justification (front, middle, back) is something I have been treating as a basic property or parameter of the wall. This morning as I really put on my thinking cap I came to the realization that this is not so. The justification is only really needed during the wall creation process and once the wall is created there is no justification, the wall just is. With that being said I need to rework the wall creation tool slightly, it shouldn't be too big of an issue but will require some serious and careful thought. For now please only use the "FRONT" justification, the other two options are flawed by their very nature. This may take me a couple days to fully think this through and come up with the correct solution. Please have patience with me while I work this one out, I need to do it slowly and carefully and get it right. 2.) I am not satisfied with the current system of applying materials to the wall assembly via the plugin. Since the plugin completely rebuilds the entire wall panel on any edit or addition of windows or doors it must somehow save the material being used for each element (group) within the attribute library. It is already setup to do this and works quite well. One can also use the edit menu to select from a static list of materials. A.) The plugin can look at the currently defined materials in the model and give the user the ability to select from any of these materials as well as the hard coded materials within the wall edit menu. B.) Perhaps and observer or something should be setup so that if the user manually opens up the wall assembly group and assigns a material to the cladding, sheathing or gypsum for a given wall panel this information is then updated within the attribute library. C.) Provide an interface within the global settings where additional hard coded materials can be added to the existing ones. The user would upload an image, assign a name and specify the X and Y scaling. It should be noted that once a material is defined by the plugin in SketchUp there is nothing stopping the user from editing that material and changing it up. Once a material is assigned and created the plugin does not try to recreate or change the material so technically you could assign your cladding to red brick for example and then simple change it to whatever you like. The important thing is that the plugin is looking for the name of the material when it regens the model, it doesn't care about all of the other properties of the material in question. The species or types of Glulam beams available are: Western Species, Southern Pine, and UK, Australian and South African varieties. Its nice to be able to recycle some code, allows one to implement something very quickly. I'm currently working on the corner cladding issue and adding in the option for a LAP or MITER corner treatment. I find this solution a potentially a bit messy since all materials are available within the drop down so there is a possibility of duplicate listings but overall it seems fairly robust and offers the flexibility needed so that the user can define their own materials within SU rather than having to rely on the plugin for a static list of pre-defined materials. The mitered corner configuration for cladding is also now working. I will address a few other small issues tomorrow morning and then release 0.7.6. I've been told that I need to add a lapped option for the sheathing as well since leaving the corners open like we do in the western US doesn't work out so well in the southeastern states. I think the next big item on the list I'll tackle is the garage doors so that at least we have one or two options for that available. Currently pre-configured doors and windows are saved by the user and accessed by the plugin from the "library" sub-folder of the plugin. The problem I see with this is that if you want to upgrade the plugin and have to remove the "medeek_wall_ext" plugin folder then you must take the added step to copy the contents of the library folder and then put it back after the updated plugin has been installed. Perhaps there is a better location for the user library or I suppose I could make its very location user definable? I recognize the need for a detailed manual however I find that tooltips like these can be much more useful and instantly accessible. 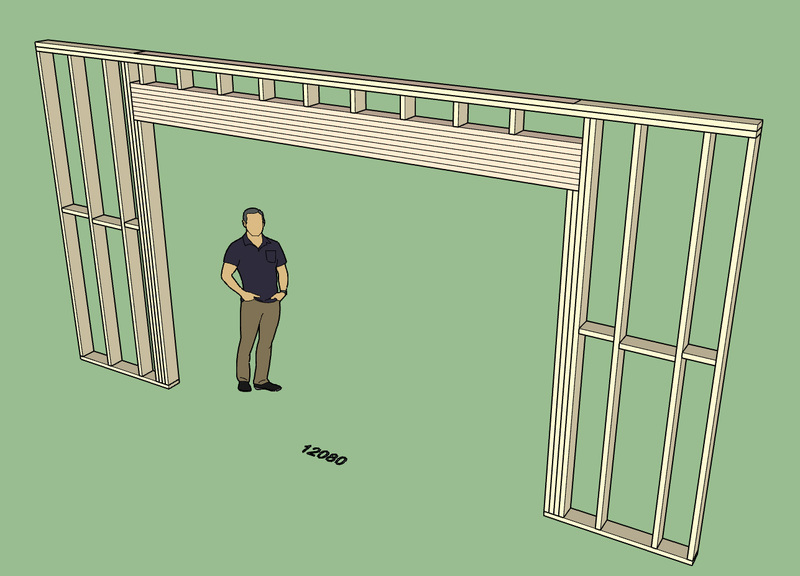 - Added the option for Glulam Beams for window and door headers. - Cladding corner treatment now has MITER and LAP available as two additional corner options. 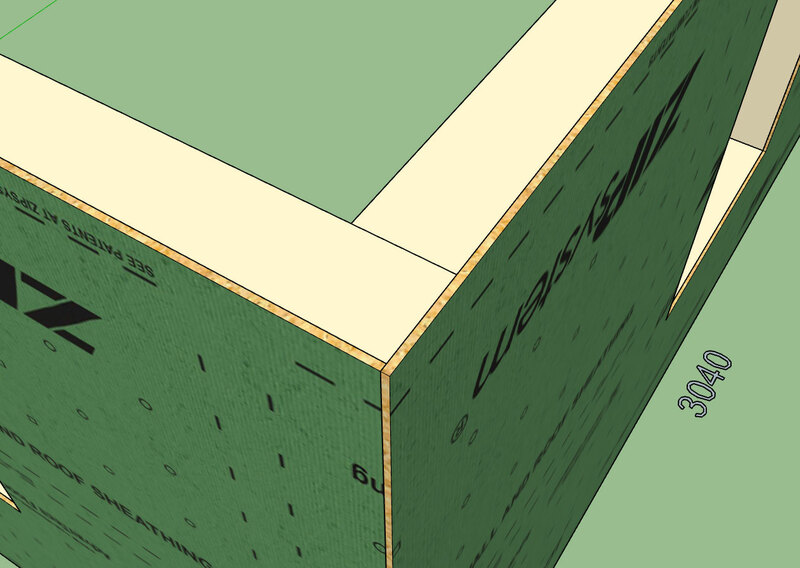 - Sheathing corner treatment now has LAP available as an additional corner option. 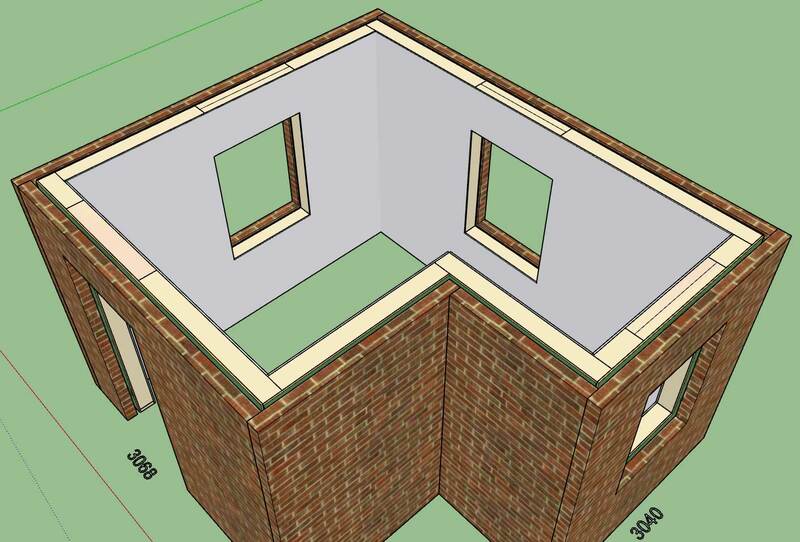 - Cladding materials selection extended to include all SketchUp materials currently in model. - Minor bug in exterior corner trim corrected. - The update status message in HTML edit menus (wall, door and window) moved to top of form for better visibility. Working with a designer this morning has exposed a few minor bugs with the auto-corner configuration. I've already addressed those and the function is that much more robust. I am now addressing another flaw with the wall creation tool (line and polyline) so that it retains the last used parameter values while creating multiple walls. I originally thought I had this enabled but determined with further testing that it was not fully implemented. I will probably roll out a sub-rev. in a couple hours that addresses all of these issues and then jump back onto the garage door and gable wall module programming.